As part of his arangetram for the global investors’ meet in Bangalore, Karnataka chief minister B.S. 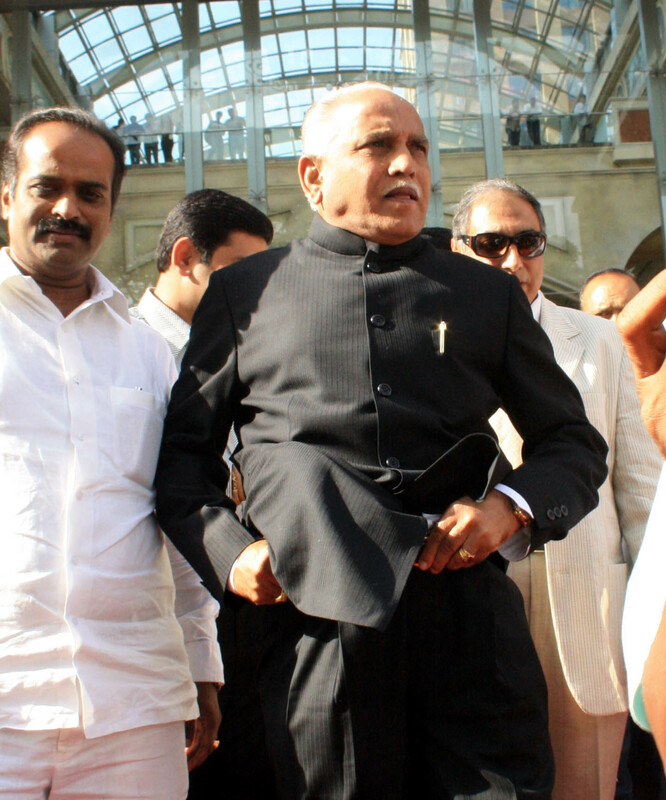 Yediyurappa has abandoned his safari suit and acquired a whole new wardrobe. He has appeared in suit and tie for television spots, and for the inauguration of the revamped Vittal Mallya road in Bangalore on Thursday, he slipped into a bandhgala, which unfortunately slightly slipped in front of pesky mediapersons whose mandate it is to capture every human foible for posterity. This entry was posted in Kannada & Karnataka, Media, Mysore-Bangalore and tagged B.S.Yeddyurappa, B.S.Yediyurappa, Churumuri, Global INvestors' Meet, Karnataka Photo News, KPN, Sans Serif, Vijay Mallya, Vittal Mallya Road. Bookmark the permalink. Your pictures are consistently great. Super photo and super reporting! Congress and Deve Gowda only save Churumuri! He would have been wearing ‘Emperor’ brand undy. Naturally he has to hold on to the pants, like dear life, from slipping down before the cameras. If this guy had anything down there, he would have shown some guts in politics!! The chameleon wanted to impress the wogs at the meet by being attired their way. The least he could have done was find a tailor to suit him well. Imagine Gandhi going to one of those round table conferences dressed in suit and tie. That would at least be appropriate for the weather over there in the U. K. Wearing a suit in our torrid clime. When will the clowns in our public life disappear? Yeddi would have advertised for his brother Karuna’s state brand ‘Tiruppur Undikkal’ had to media prodded him a little further. when do we get to see ex-pm deve glowda flashing his glowing Patta-Patti ? C’mon Churmuri, you can do it. what ‘Super churumuri’, ‘excellent journalism’? If this is journalism then god save journalists. Page 3 mongers out there in bunches! Give the man a break… Try some responsible journalism instead…for a change. Shameful Churmuri is stooping too low! Having a biased opinion is one thing, but making fun of a person adjusting his trousers is really in a bad taste. The official residence of Yeddi is supposed to be getting blackout curtains now.